You can't cut down this forest – it's floating. 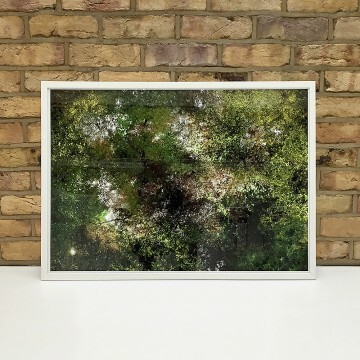 A forest without roots – ongoing experimental series of visuals created by painstakingly merging treetop photographs taken from below. The tree trunks are hidden however in order to create the illusion of a floating or flying forest that can effectively not be cut down. This version – Flying Forest (33) – was stitched together using a whopping thirty-three separate photographs.